The EUR/USD is consolidating following yesterday’s solid gains in reaction to encouraging Chinese Manufacturing PMI data in conjunction with a 25 basis point increase from the RBA. Meanwhile, gold has broken past its psychological $1200/oz level and the S&P futures are holding strong above their own highly psychological 1100 level. Therefore, the EUR/USD’s positive correlations are creating an environment conductive for another leg up in the currency pair. However, investors are presently waiting upon America’s ADP Non-Farm Unemployment Change number due this morning. A tough employment market has been a thorn in America’s side during its economic recovery. In a noteworthy development, last week’s Unemployment Claims finally dipped below their psychological 500k level. Hence, a smaller than expected decline in today’s ADP figure could result in a pop in the risk trade. On the other hand, sluggish ADP data could drag the EUR/USD back towards its psychological 1.50 level. In addition to today’s ADP Non-Farm Unemployment Change data, Euro investors are eagerly awaiting tomorrow’s ECB meeting. Trichet had a more hawkish tone at the central bank’s last press conference. Therefore, it will be interesting to see whether the ECB maintains this tone or even delivers a shock be extracting some of its alternative liquidity measures. Either way, there is a bit of uncertainty heading into tomorrow’s meeting, meaning we could witness sizable volatility over the next 24-48 hours, especially considering the U.S. will announce its headline Unemployment Rate on Friday. Technically speaking, the EUR/USD has created some space between present price and the psychological 1.50 level. The currency pair has cleared October highs once again and could take a shot at November highs. That being said, investors should monitor the EUR/USD’s interaction with our 3rd tier downtrend line and 11/25 highs should they be tested. A breakout beyond these two technical barriers could yield a more accelerated upward movement. As for the downside, the EUR/USD has multiple uptrend lines serving as technical cushions along with intraday lows and the psychological 1.50 level. The Cable has added onto yesterday’s rally during today’s Asia trading session in reaction to encouraging comments from the BoE’s chief economist, Spencer Dale. During a business conference in eastern England, Spencer Dale noted that he believes the UK’s economy has turned a corner. Dale’s comments during the conference brought more buyers to the table despite yesterday’s mixed econ data. While the Nationwide HPI figures printed about in line with analyst estimates, Manufacturing PMI data from both the UK and US dipped. However, investors seem to be brushing the sluggish manufacturing data aside and are opting to focus on the overall sustainability of the global economic recovery. Spencer Dale’s comments combined with positive Chinese data and a rate hike from the RBA have proven enough to bring the risk trade back into play. Right now investors are waiting for this morning’s ADP Non-Farm Employment Change number. A tough employment market has been a thorn in America’s side during its economic recovery. In a noteworthy development, last week’s Unemployment Claims finally dipped below their psychological 500k level. Hence, a smaller than expected decline in today’s ADP figure could result in a pop in the risk trade. On the other hand, sluggish ADP data could deflate the Cable’s present rally and drag the currency pair back towards 1.65. In addition to today’s U.S. employment release, investors are eagerly awaiting tomorrow’s ECB meeting. Trichet had a more hawkish tone at the central bank’s last press conference. Therefore, it will be interesting to see whether the ECB maintains this tone or even delivers a shock be extracting some of its alternative liquidity measures. Either way, tomorrow’s ECB decision could have an impact on the overall risk trade. In addition to the ECB meeting, Britain will release its Halifax HPI and Services PMI data points. Investors will likely be paying rather close attention to the PMI number since services account for nearly 70% of the UK’s GDP. Meanwhile, gold has rallied beyond its psychological $1200/oz level and the S&P futures are holding strong above their own highly psychological 1100 level. Hence, the Cable’s positive correlations are currently creating an environment supportive of further downward movements in the Dollar should economic fundamentals comply. That being said, investors should also keep an eye on the EUR/USD and its interaction with our 3rd tier downtrend line as well as November highs should they be tested. A topside breakout in the EUR/USD could signal a more extensive rally in the FX risk trade, thereby benefitting the Cable. Technically speaking, the Cable still faces multiple downtrend lines along with 11/25 and 11/17 highs. Our 4th tier downtrend line appears to carry the most weight since it runs through 11/17 highs. A movement beyond our 4th tier could imply more extensive near-term gains in the Cable. As for the downside, the Cable could find supports in the psychological 1.65 area along with 11/20, 11/30, and 11/27 lows. Additionally, the GBP/USD has multiple uptrend lines serving as technical cushions. The USD/JPY is consolidating following a muted reaction to yesterday’s emergency BoJ meeting. As we highlighted in yesterday’s commentary, the BoJ made 10 trillion Yen available for loans to commercial banks at the central bank’s 0.1% benchmark rate. Investors still don’t seem too impressed by the results of yesterday’s emergency meeting since many bulls were hoping for more excessive QE measures. Therefore, although yesterday’s decision by the BoJ may have stabilized the USD/JPY, thus far it hasn’t been enough to cause any noteworthy devaluation of the Yen. Hence, it will be interesting to see whether Japan’s Finance Ministry applies more pressure on the BoJ to use more tools to fight a strengthening Yen. Meanwhile, focus is shifting back to the EU and U.S. The ECB will make a monetary policy decision of its own tomorrow and the U.S. will release weekly Unemployment Claims along with ISM Non-Manufacturing PMI data. Hence, FX markets could be in for a busy 24-48 hours. Technically speaking, 85 continues to serve as a psychological cushion while 90 hangs far overhead. Should conditions deteriorate below 85, we notice that the 82.50-85 area proved to be a strong support area during the Spring/Summer of 1995. Therefore, the USD/JPY could experience similar support should the currency pair’s downturn continue. 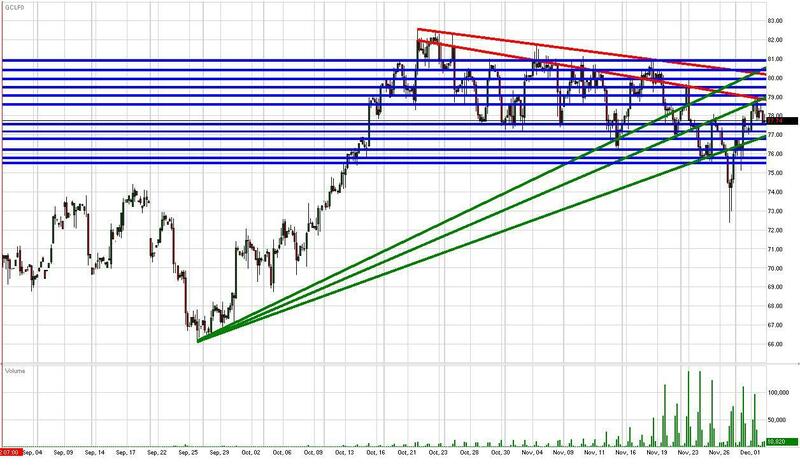 As for the topside, there are multiple downtrend lines serving as technical barriers along with Tuesday’s highs as the long-term downtrend bears down on price. Hence, the USD/JPY has its work cut out for it to the topside should the currency pair want to re-challenge the highly psychological 90 level. Meanwhile, an encouraging development would be for the USD/JPY to move back above January ’09 and October ’09 lows. Gold’s incredible uptrend appears alive and well after the precious metal popped passed $1200/oz with relative ease. Gold continues to knock down barriers as investors and governments look to divest from the Dollar. Yesterday’s positive manufacturing data from China combined with the RBA’s 25 basis point increase was enough to signal that the rally of emerging economies is continuing. Hence, investors were confident enough to send gold past $1200/oz while delivering another round of Dollar weakness in succession with a rally in emerging equities. Meanwhile, investors are eagerly awaiting tomorrow’s ECB monetary policy meeting along with key econ releases from the U.S. and UK. Therefore, investors should keep an eye on activity in the Dollar over the next 24-48 hours. Should U.S. and UK data print positively and the ECB deliver a more hawkish monetary policy stance we may witness another wave of Dollar weakness, thereby sending gold higher due to its negative correlation with the Greenback. On the other hand, a retracement towards $1200/oz wouldn’t be surprising since we witnessed similar at $1100/oz and $1000/oz. Technically speaking, gold has multiple uptrend lines serving as technical cushions in addition to 11/30 and 11/24 lows. Furthermore, the psychological $1200/oz and $1175/oz levels serve as supports should they be tested. As for the topside, we’re still unable to initiate a reliable downtrend line due to the lack of historical data. Therefore, the psychological $1200/oz level and intraday highs serve as the only technical barriers for the time being. Crude’s rally was deflected by our 1st tier downtrend yesterday and the futures neglected to test the highly psychological $80/bbl level. Crude is presently consolidating back around $78/bbl as investors await weekly crude inventories. Investors are expecting an inventory decline of -400k barrels. Should inventory data print lighter than expected, crude may opt to retest our 1st tier downtrend line. Investors should keep in mind that the $80/bbl level has proven to be a strong psychological barrier over the past month and a half of trading. Meanwhile, the Dollar is strengthening a bit after ADP Non-Farm Employment Change data came in a little weaker than analyst expectations. However, today’s Dollar strength could be minimal since investors may place more weight on tomorrow’s ECB meeting along with key UK and U.S. econ data releases. That being said, investors should keep an eye on the overall behavior of the risk trade over the next 24-48 hours. Should the ECB have a hawkish monetary stance along with positive econ data from the UK and U.S., then we may witness another wave of Dollar weakness, a positive catalyst for crude. However, should the ECB issue a cautious monetary statement along with unimpressive data, then crude may opt to consolidate back towards our 1st tier uptrend line and 11/25 lows. Technically speaking, crude futures have our 1st tier uptrend line serving as a technical cushion along with 11/25 lows and the psychological $75/bbl level. As for the topside, crude faces our 1st and 2nd tier downtrend lines along with 12/01, 11/23, and 11/18 highs. Hence, crude appears to be wedged between solid supports and resistances as investors decide where to send the Dollar and equities over the near-term. That being said, investors should also monitor the S&P’s interaction with 1100 and previous 2009 highs since equities are normally positively correlated with crude. The S&P futures are moving sideways just beneath previous 2009 highs as disappointing ADP Non-Farm Employment Change data counterbalances optimism stemming from the RBA’s rate hike and encouraging Chinese manufacturing data. Furthermore, yesterday’s uptick in U.S. Pending Home Sales showed America’s housing market is continuing to stabilize. However, today’s setback in employment data is a bit discouraging and could place more weight on tomorrow’s weekly Unemployment Claims along with Friday’s headline Unemployment Rate. Weekly Unemployment Claims registered a key decline below the psychological 500k level last Friday. Therefore, another sizable decline in Unemployment Claims could spur a rally as a beleaguered U.S. employment market picks up. The U.S. will also release ISM Non-Manufacturing PMI data tomorrow in succession with a public address from Fed Chairman Bernanke. In addition to tomorrow’s key econ data, the Fed will also release its Beige Book this afternoon containing minutes the previous Fed Meeting. A more positive outlook on the economy from the Fed could help buoy the S&P and the risk trade as a whole. Meanwhile, FX investors will be eyeing key HPI and Services PMI releases from the UK along with an ECB Meeting. The ECB meeting could be a Dollar mover should the central bank issued a more hawkish monetary policy statement. Trichet had a more aggressive hawkish tone at the ECB’s previous press conference, adding a bit of uncertainty to tomorrow’s policy statement. If the ECB should remove some of its alternative liquidity measures tomorrow, this could deliver a negative shock to the Dollar and help the S&P’s uptrend due to the negative correlation between U.S. equities and the Greenback. That being said, investors should monitor the EUR/USD’s interaction with our 3rd tier downtrend line and November highs should they be tested. Furthermore, our 4th tier downtrend line on the Cable could play a key technical role along with its own November highs. Breakouts in the EUR/USD and GBP/USD could yield new 2009 highs in the S&P futures due to correlative forces. Technically speaking, the S&P futures face topside barriers in the form of the psychological 1100 level and 11/25 highs. The futures have moved back above our 1st tier uptrend line, a positive technical development. As for the downside, the S&P has 11/30 and 11/27 lows serving as technical cushions along with the psychological 1100 and 1075 levels.